Forty years on, the battle has enduring lessons for Vietnam’s naval modernization. On January 16, 1974, the Republic of Vietnam Navy (RVN) discovered the presence of the Chinese People’s Liberation Army (PLA) in the Crescent Group in the western Paracel Islands, which was held by South Vietnam. This was an unexpected development, because notwithstanding the reduced U.S. military assistance to Saigon after the signing of the Paris Peace Accords in 1973, and subsequent reduction of South Vietnamese garrisons on the islands, the Chinese had not taken unilateral actions to subvert the status quo – by which the Amphitrite Group in the eastern Paracels and the Crescent Group were respectively under Chinese and South Vietnamese control. Over the next two days, the opposing naval forces jostled with one another in close-proximity maneuvers off the islands, before a firefight erupted as the South Vietnamese troops attempted to recapture Duncan Island. The skirmish subsequently escalated with overwhelming Chinese reinforcements deployed to the clash zone, including close air support staged from nearby Hainan Island and missile-armed Hainan-class patrol vessels. Shorn of American naval support, given that the U.S. Navy Seventh Fleet was then scaling down its presence in the South China Sea following the peace accords of 1973, the RVN was utterly defeated. Beijing swiftly exploited the naval victory with an amphibious landing in force to complete its control of all the Paracel Islands. The Battle of the Paracel Islands has since gone down history as the first Sino-Vietnamese naval skirmish in the quest for control over the South China Sea isles. 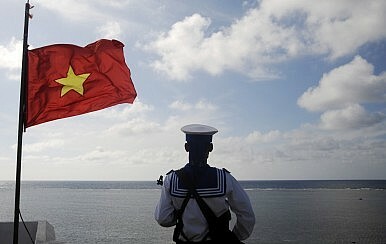 The Sino-Vietnamese naval skirmish in the nearby Spratly Islands in 1988 was the second and final such instance. Since then, tensions have eased. There have been continued exchanges at the ruling party level and between the countries’ militaries (including the hosting of a PLA Navy South Sea Fleet delegation to a Vietnamese naval base). Beijing and Hanoi have also recently inaugurated mutual consultations on joint marine resource development in the South China Sea. However, the Battle of Paracel Islands in 1974 yields some useful and enduring lessons for Hanoi and its ongoing naval modernization in the South China Sea, particularly in the face of geopolitical developments. No international and regional treaties constitute perfect safeguards against unilateral action, including threat or use of force. The landmark Declaration on the Conduct of Parties in the South China Sea inked in 2002 between China and the Southeast Asian claimants has not been entirely successful. In fact, unilateral actions aimed at subverting the status quo in the South China Sea by threat or use of force has continued to dominate. Recent video footage revealed by China’s CCTV in January 2014 showed a standoff between Chinese and Vietnamese law enforcement ships off the Paracel Islands back in 2007. More recent, recurring incidents included the harassment of Vietnamese survey ships by Chinese vessels, the Sino-Philippine maritime standoff in the Scarborough Shoal in April 2012 and, later, the show of force by Chinese surveillance ships and naval frigates off the Philippine-held Second Thomas Shoal. These episodes bear an eerie resemblance to the sort of naval jostling that led to the skirmish back in 1974. Even as the South China Sea claimants engaged in consultations on a Code of Conduct, upon unilaterally declaring an air defense identification zone (ADIZ) over the East China Sea in December 2013, Beijing declared indisputable rights to create ADIZs in other areas if it so desired. An ADIZ over the South China Sea, if ever established, would undoubtedly strengthen Beijing’s hand over the disputed waters, augmenting regular unilateral fishing bans, an earlier expanded maritime law enforcement authority for the Hainan authorities as well as the latest Chinese fisheries law requiring foreign fishing vessels to seek permission from Beijing to operate in much of the South China Sea. These developments, if they continue unabated, will only heighten the risk of accidental or premeditated clashes in the disputed waters. There has been growing interest among extra-regional powers in the South China Sea. Besides the U.S. Asia-Pacific rebalancing, Japan under Prime Minister Shinzo Abe has intensified its Southeast Asian diplomatic offensive, one of the objectives being to promote Tokyo’s territorial stance in the East China Sea. Vietnam has become one of the major beneficiaries of this development. During the 4th U.S.-Vietnam Defense Policy Dialogue held in Washington in late October 2013, an agreement was reached to enhance maritime security cooperation. In the same month, Tokyo was reportedly keen to supply patrol vessels as part of a plan to bolster Vietnam’s maritime security capacity-building efforts. Also notable, Hanoi is enjoying budding defense ties with New Delhi, having hosted regular Indian Navy port visits in the past decade. Still, none of the extra-regional powers has taken any side on the South China Sea disputes, preferring to focus only on freedom of navigation. This means that even though Washington or Tokyo have legitimate reasons to intervene if vital sea lines of communications through the South China Sea are threatened by the specter of armed conflict, any extra-regional help is far from certain. For instance, even if the U.S. Pacific Command is able to detect tell-tale signs of unusual Chinese military movements in the South China Sea, it may not be able to react in time. The U.S. Navy Seventh Fleet, as part of the rebalancing strategy, has intensified maritime surveillance in the area: the new Littoral Combat Ship U.S.S. Freedom is said to be conducting more than mere training missions in the area while the U.S. Navy was reported to have stepped up maritime aerial surveillance since July 2012. However, during the skirmish in 1974 Saigon sought assistance from the U.S. Seventh Fleet, but it was under orders not to intervene in the disputes and no help arrived for the RVN off the Paracels. Washington is likely to adopt the same stance today, even if a renewed Sino-Vietnamese naval clash were to erupt, especially in localized contexts that do not necessarily impinge upon freedom of navigation by other users. Moreover, the present and future PLA Navy South Sea Fleet is no longer the same run-down, coastal-oriented force operating Soviet-era small patrol and attack forces it used to be. With its steady accumulation of force projection capabilities, including amphibious assault, the PLA Navy is in a better position than back in 1974 to deploy sizeable forces over sustained durations at greater distances to assert sovereignty, and its overall combat power will be far more potent if ever unleashed in the South China Sea. There is no way for Vietnam to quantitatively match the PLA naval capabilities in the South China Sea. Consistent with Hanoi’s policy pronunciations, an arms race with China is not only impossible in the first place, but is considered potentially detrimental to Vietnam’s ongoing Renovation process. Vietnam’s post-Cold War naval modernization has been predicated on filling capacity shortfalls after previous decades of neglect. In recent years, the Vietnam People’s Navy had made notable strides in acquiring new hardware to replace the ageing Soviet-era equipment. However, the new, mostly Russian-supplied capabilities, such as Gepard-3.9 light frigates, Kilo-class submarines, Su-30MK2V Flanker multi-role fighters equipped for maritime strike and Yakhont/Bastion coastal defense missile batteries, Dutch-built SIGMA-class corvettes as well as locally-built coastal patrol and attack craft all point to a force modernization pathway based primarily on denying an adversary access to the disputed zone. They do not suggest an ability to secure Vietnam’s own access. Yet, the Battle of the Paracel Islands in 1974 highlighted the need to not just deny an adversary from blockading the South China Sea features but also to secure Vietnam’s own access to those exposed and vulnerable garrisons. Only a shift from sea denial to sea control can hope to attain that. Given the durable peace along the land borders with her neighbors, Vietnam should logically emphasize air-sea warfighting capabilities. For status quo-oriented Vietnam, much akin to what Saigon was back in 1974, the foreseeable combat scenario in a renewed South China Sea clash will encompass the need for Vietnamese forces to recapture seized features, or at least reinforce existing garrisons in the face of hostile attack. Under this scenario, Vietnam’s defense predicament is perhaps no different from Japan’s with respect to the East China Sea dispute. Tokyo has outlined in its recent new defense strategy the need for robust, integrated mobile defense, which envisaged the need for the Self-Defense Force to recapture the East China Sea isles in times of hostilities. Certainly Vietnam cannot hope to muster the same range of capabilities as Japan could, given economic constraints. To build at least limited sea control capabilities, Hanoi ought to focus on improving early warning and expanding amphibious sealift capacity. Existing Vietnamese early warning capabilities are vested in a static electronic surveillance network arrayed along the Vietnamese mainland coast and in occupied South China Sea features, augmented only in recent years by maritime patrol aircraft of the Vietnamese navy and coastguard. These planes are mainly designed for surface surveillance, yet are handicapped in endurance and lack adequate anti-submarine warfare capabilities especially in view of the increasing PLA submarine challenge. A high-endurance maritime patrol aircraft fitted with longer-range sensors will be appropriate, and arguably more survivable than static installations. The Vietnam Naval Infantry, which specializes in amphibious assault and has been streamlined over the decades, has become a leaner yet meaner force with the acquisition of better equipment. Still, it remains short on amphibious sealift capacity, given that the Soviet and ex-U.S. vintage landing ships were too old and mostly no longer operational. Hanoi’s fledgling naval shipbuilders have so far produced a small handful of new assault transports ostensibly to fill this gap. However, more such vessels are required to enable the Vietnam Naval Infantry to project more substantial forces with greater rapidity in order to reinforce the South China Sea garrisons or to recapture them from an adversary. The Battle of the Paracel Islands might have happened a long forty years ago. Still, even though the South China Sea has seen relative peace, it pays for Hanoi to remain vigilant by sustaining the pace of its naval modernization attempts. While diplomacy is the preferred recourse and extra-regional powers have become more heavily involved in the region, adequate military power in the form of defense self-help remains necessary, especially when the area continues to be fraught with uncertainty. Compared to the RVN, for now and in the foreseeable future the Vietnam People’s Navy and Air Force faces a challenge far greater than before in preserving the status quo in the South China Sea. Ngo Minh Tri is Managing Editor of the Thanh Nien newspaper, based in Ho Chi Minh City, Vietnam. Koh Swee Lean Collin is an associate research fellow at the Institute of Defence and Strategic Studies, a constituent unit of the S. Rajaratnam School of International Studies at Nanyang Technological University based in Singapore. This article reflects the personal viewpoints of the authors and not representative of their respective organizations. Expectations that Hanoi will enter Washington’s embrace appear unrealistic as the pro-Chinese camp prevails in Vietnam.